I’ve always wanted to do something important with my life; I’ve felt this way as long as I can remember. I grew up with video games and cartoons where the main characters had some sort of superpower. 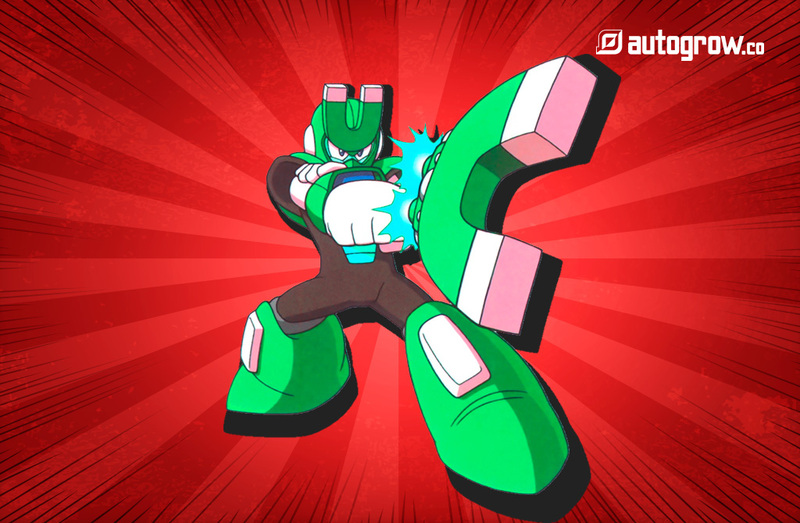 The hero could level up by defeating enemies or solving problems and puzzles. Being able to produce real leads for your business is like having a marketing superpower. Only a handful of people know how to do it well. How many leads you can generate on a daily or weekly basis is in direct relation to how fast your business grows. The trouble with that was when people first came to our website, they were not ready to buy from us. A lead magnet is a landing page or an offer (usually free) dedicated to giving your website visitor some relevant value in exchange for their contact information (at the very least, an email address). When you master lead magnets, you pretty much have superpowers to grow your business as fast as you want. This is because there is almost always has to be a middle step that involves building trust and following up with prospects until they are ready to buy. Furthermore, 98% of your traffic isn’t ready to buy right now, and 70% of all website visitors on average will never return to your website. This is the “middle=gap” that lead magnets help to fill by offering people incentives to provide their contact information and join onto your email list. Important Note: This article is meant to serve as a resource to you as you go about creating your own lead magnets and free offer landing pages, so I encourage you to bookmark it, and you can download a PDF copy of our lead magnet checklist here. What is it: Planscope.io is a SaaS tool to help web developers and designers create collaborative estimates with clients and keep them up to date as projects move towards completion. How the lead magnet works: Anyone who wants to see the product in action can enter their email address. They are immediately taken through an interactive demo of how the tool works to help them grow their business and get work done. Each lead is also added into an autoresponder that follows up with them if they don’t go through with the purchase. Why it works: People love tools that help them save time or be more productive. Since Planscope.io promises to help freelancers and teams do both when it comes to managing their projects, an email address is seen as a small cost for a potentially huge benefit. The simplicity of signup is also undoubtedly a big factor in why it works. The signup form is only one field. In a previous test here at AutoGrow, I was able to double our email opt-in conversion rate simply by reducing the number of form fields. What is it: GrooveHQ is a help desk software tool. It helps SaaS and ecommerce companies keep track of and respond to customer support requests. 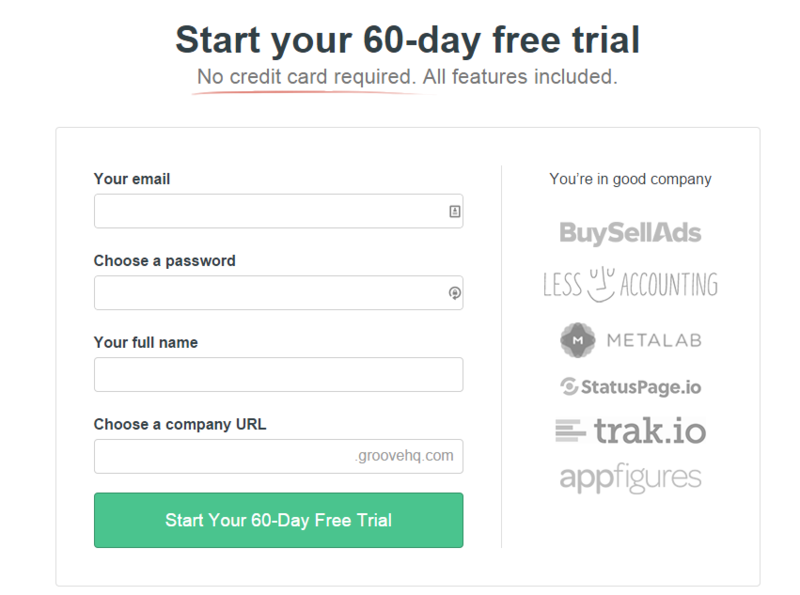 How the lead magnet works: Groove offers a 60-Day Free Trial on their homepage. You can also find plenty of support information about the product. Interested prospects can sign up with a few clicks. 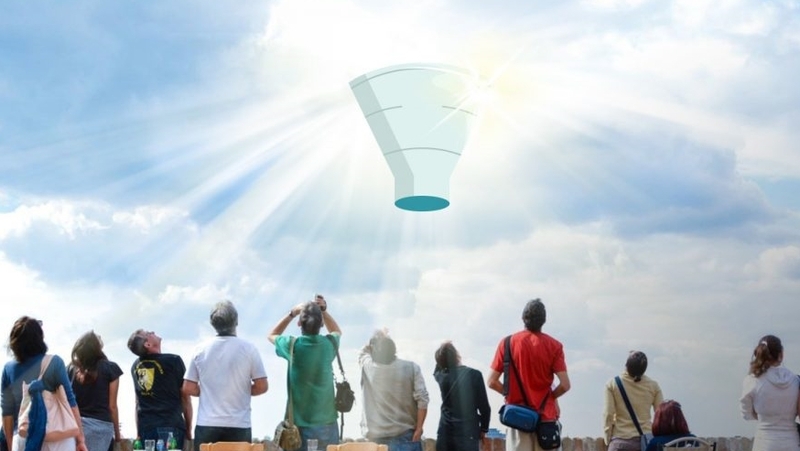 Why It works: People love anything free, as we saw in the first example with Planscope. While Groove offers its benefits for free with a time limit, it’s possible they are converting at a lower rate than if the offer was open-ended. Still, a benefit to this time limit would be to weed out prospects who aren’t serious about taking the software for a test-drive. The other major reason this offer likely converts so well? It’s surrounded by lots of social proof– like the logos of other companies that use Groove, a video testimonial, case studies, and more. What is it: AutoGrow (this website) is a company specializing in landing page and sales funnel design.I chose to create a related offer with a PDF checklist that people could follow when building out or looking to improve their website sales funnel. How the lead magnet works: The offer is shown across our website both as a content upgrade on a few blog posts and in the form of an exit detection pop-up. 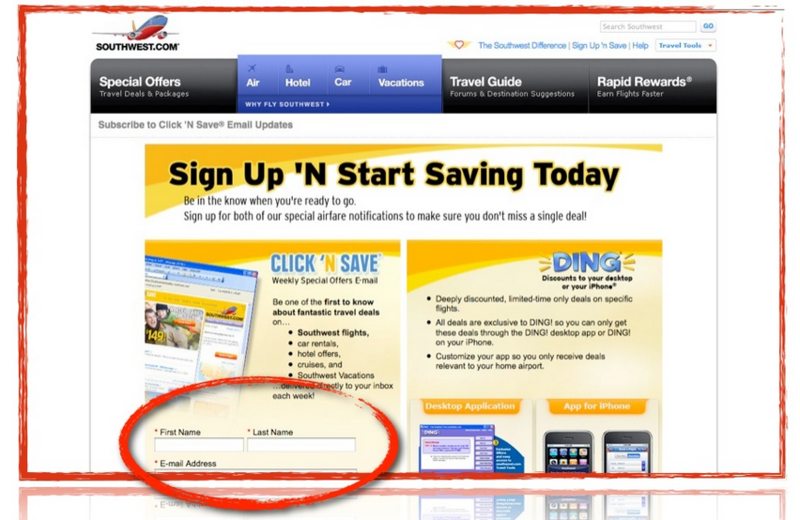 What it is: If you visit Southwest Airlines’ website to book a flight, chances are you’ll come across one or more offers to join their email newsletter with the promise of coupons and special deals. 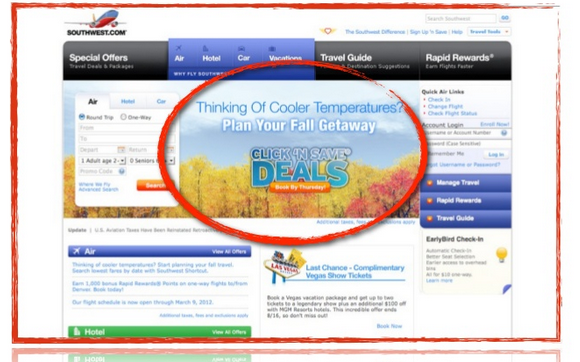 How the lead magnet works: In this lead magnet example, you would come in to the Southwest Airlines website and see an ad (top image, center) promoting what it calls “click and save” deals. People love free stuff, and enjoy saving money whenever possible. An email address is a small price to pay to potentially save $100 or more, especially if you’re a regular traveler. Important note: the landing page uses a personalized marketing technique to reflect the current season, with autumn trees pictured in the background. I have little doubt that this is a positive factor in their conversion rate for this offer. What is it: Infusionsoft is a company that provides marketing automation software for small and medium-sized businesses. It works by integrating email automation with CRM and e-Commerce capabilities. How the lead magnet works: Visitors arrive on the landing page above and get a brief overview of the benefits of taking the five-minute assessment. At the end of the assessment, they are asked to input their email in order to see their results. People are vain. We always want to know more about ourselves as well as compare ourselves to others. An assessment is one way we can measure ourselves in this respect. Asking the visitor for their email address after he or she has already gone through the assessment is key. People are loss averse, and having already invested a few minutes into taking the assessment, the vast majority will be willing to enter their email address to discover some information about themselves. What is it: I’ve come across this lead magnet several times from DigitalMarketer.com, a digital marketing membership website offering info-products and a private login area for paying members. Part of the reason the company promotes this lead magnet over others is because it has performed so well for them. Digital Marketer has generated more than 28,000 leads in its first month and a half. 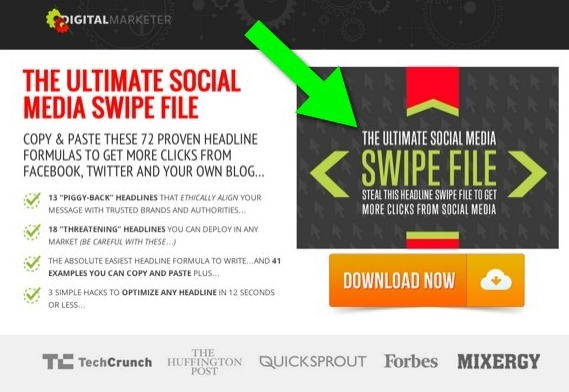 How the lead magnet works: Visitors are sent to a simple landing page (most of the content is above the fold) advertising the swipe file resource as seen above. After clicking the call-to-action button, the visitor is immediately shown a pop-up opt-in box asking them for their email address. After the visitor opts in, they are immediately redirected to a download page where they can click to download the file. Targeted ad traffic: Though the company touts how well this lead magnet has converted, you should be aware that the company used paid ads (in part or in whole) to drive those leads. If you’re thinking you’ll copy this example and BOOM, get the same results right away, you might want to temper your expectations a bit. 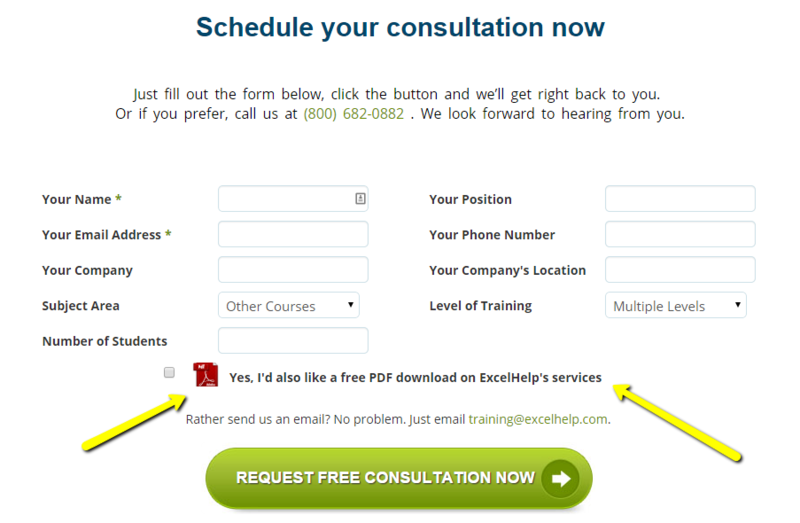 Two-step opt-in: this is where you have a call-to-action button in place or where you might normally put a form field. The form in this case is only shown after the user clicks. This results in a higher conversion rate and it positions the page more as “giving” value rather than “taking” value. What is it: StealthSeminar.com is an automated webinar software for people who prefer to let their webinars run on autopilot rather than hosting a live event. It’s a little shady, in my opinion, but it works for some businesses and marketers by “tricking” people into thinking the webinar they are watching is actually live. The lead magnet idea pictured above is pretty straightforward by comparison. It offers people planning a webinar, a free “cheat sheet” guide on when the best time to host your webinar, is. How the lead magnet idea works: This lead magnet works the same as the example above from Digital Marketer, using the two-step email opt-in technique. Simplicity: very clear offer, little text. Either you’ll take it or you won’t. 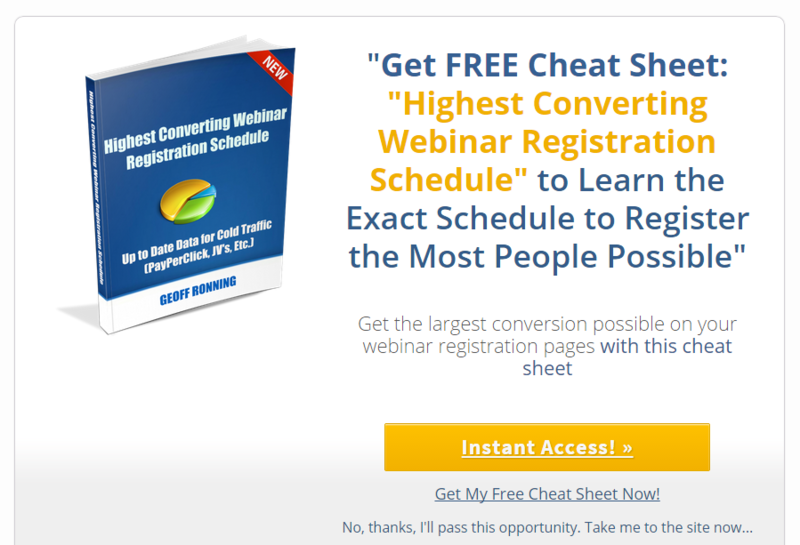 Multiple studies show that giving multiple options to convert increases overall conversions. This is why you see a link directly above the yellow “Instant Access” button, which does the same thing as the button.. It solves a marketer’s common problems. I found this before I hosted my first webinar and I can tell you firsthand that it was helpful. Ready to create your lead magnet? 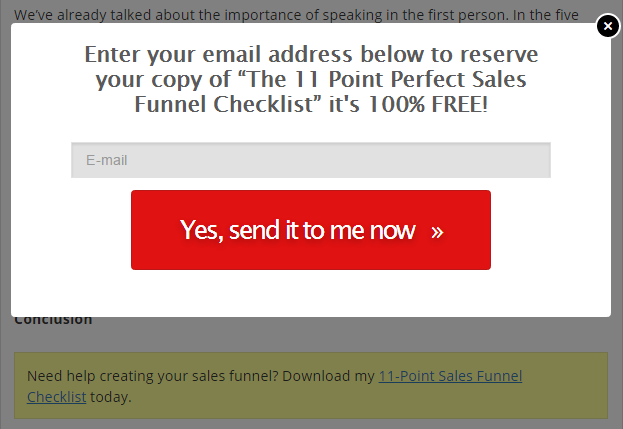 Don’t do it without our 11-Point Perfect Sales Funnel Checklist. 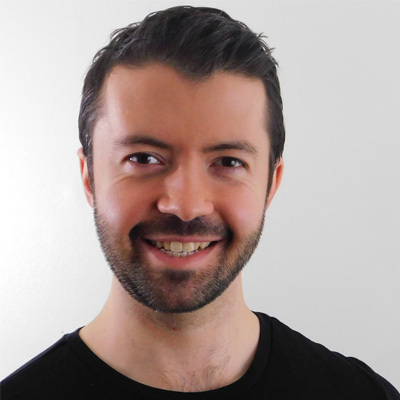 What is it: John Lee Dumas is famous in the “quit your job and do a startup around your passion” community for the swift progress he and EntrepreneurOnFire have made over the last two years. The landing page above is for his weekly webinar, Podcaster’s Paradise, where he teaches viewers about the benefits of starting their own podcast. The webinars are usually well-attended, regularly bringing in over 100 people at any given time. The upsell on the webinar is the private community and info product that teaches students how to create their podcast and earn a living from it. 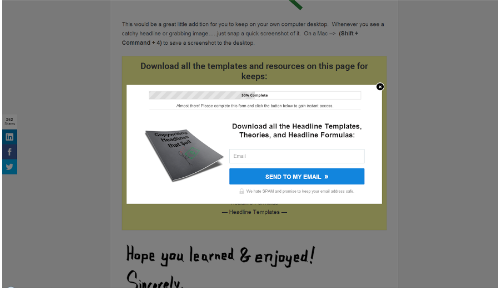 How this lead magnet idea works: The landing page design and lead magnet work to drive leads using a two-step opt-in process (visitor reads page, and then clicks on the “call to action” button to view a pop-up with a form field to input their email). High visibility: Multiple pages on the EOFire site are linked to this landing page, including an ad in the sidebar of their blog which, when clicked, immediately shows the pop-up form instead of taking the visitor to the landing page first. Visibility is one of a four or five key “levers” you can pull to increase your lead generation / email sign-up rate. Specific value. Just like the other lead magnet ideas listed in this article, it’s all about matching value to the needs of the market. It’s harder to deliver more value in the form of one-hour live, interactive show. Simplicity. One form field; just enter your email and you’re in. The above is a lead magnet that gives email subscribers a free “case study” in exchange for their contact info. How the lead magnet idea works: Landing page visitors are asked to input their first name and email address to get access to a “case study” that shows how SalesForce.com implemented a new content strategy, which netted them over 10,000 new leads per month. The reason I put “case study” in quotes above is because it looks like the PDF lead magnet is telling the story of what SalesForce did to get results, but not because they were an actual client of JTN. Why it works: Even if you don’t have a big client name that you’re currently working with right now, you can still leverage their brand to build your own brand, by telling the story of how they got results. Of course, it’s probably a good idea t to be more upfront about the fact that they aren’t a client and you’re just reporting the news. People like to read about what has worked for others in getting results and how they accomplished it, step-by-step. What is it: I love this example because it’s one of those lead magnet examples that has worked to get massive results with seemingly little effort. Clay Collins, the co-founder over at LeadPages.net shared this one a while back but it will remain relevant for a long time to come. 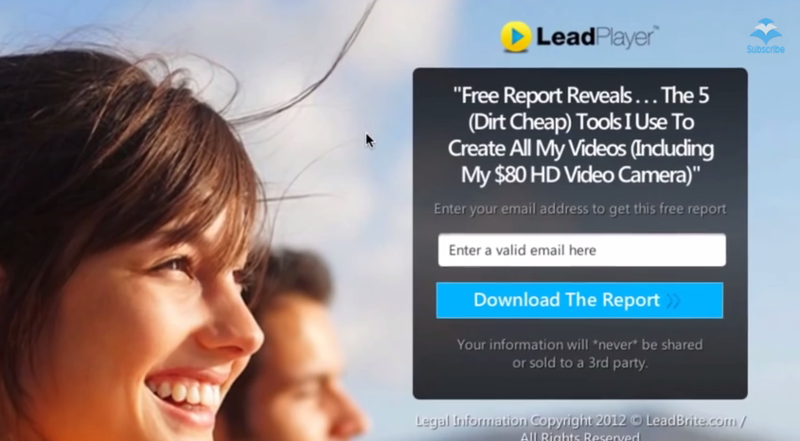 All it is, is a super simple landing page, offering visitors a free PDF report with a short list of tools! Visitors arrive on the page. Visitors read the sales copy with the offer. Visitors decide to enter their email to get the report delivered to their inbox, or not. Showing a human face looking at the sales copy results (research has shown, see the video for the specific study) in visitors being more likely to read the text offer presented to them. What is it: Yes, believe it or not, you can generate extremely qualified leads by offering sales material that is 100% related to buying your stuff. 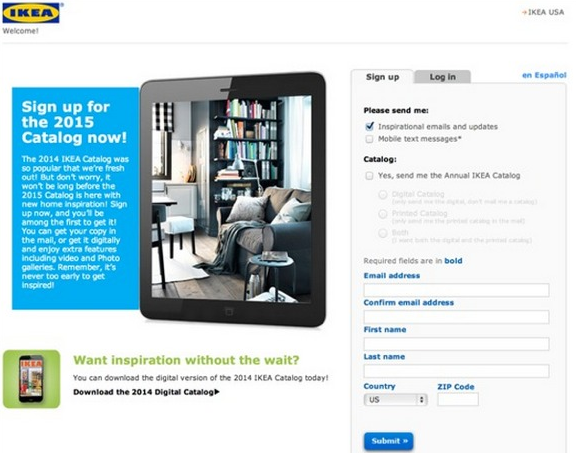 IKEA will send potential customers who opt in to a digital catalogue with a list of their product offerings. How the lead magnet works: People arrive on the landing page and can either login or sign up to receive access. They have the option of receiving a physical or a digital copy of the catalogue. The offer form is on the right side of the page. This is a practical design choice since the human eye typically moves from the left to the right side of the screen. There’s a clear picture of what they will get (you can see a picture of an iPad with the digital catalogue on it). What is it: This lead magnet is from one of ExcelHelp.com’s landing pages where prospects can fill out a form to get a free consultation (AutoGrow designed this one). Similar to the IKEA catalogue example above, the offer is for “sales material” in the form of a PDF download and a personal, one-on-one consultation. How the lead magnet works: Prospects arrive on the page and are able to learn about the benefits of ExcelHelp’s services. If they’re interested in learning more about how they can hire ExcelHelp or they want pricing information, they would fill out the form. Value-stacking: offering a PDF adds extra incentive for visitors to the page enter their contact information. There’s also an “ownership” angle to this equation whenever you offer something you can download. People like to “own” digital assets via download, which they can refer back to later. Form length: generally speaking, someone willing to fill out a longer form is going to be a much more qualified prospect because they have to spend extra effort in order to get what they want. There is a direct relationship between these two factors. I’ve seen it time and again in our own tests here on AutoGrow.co, in the previous businesses I’ve worked on, and within our client’s businesses. What is it: MuleSoft helps companies connect various SaaS tools and enterprise-level apps together to create automation benefits and shared data benefits. 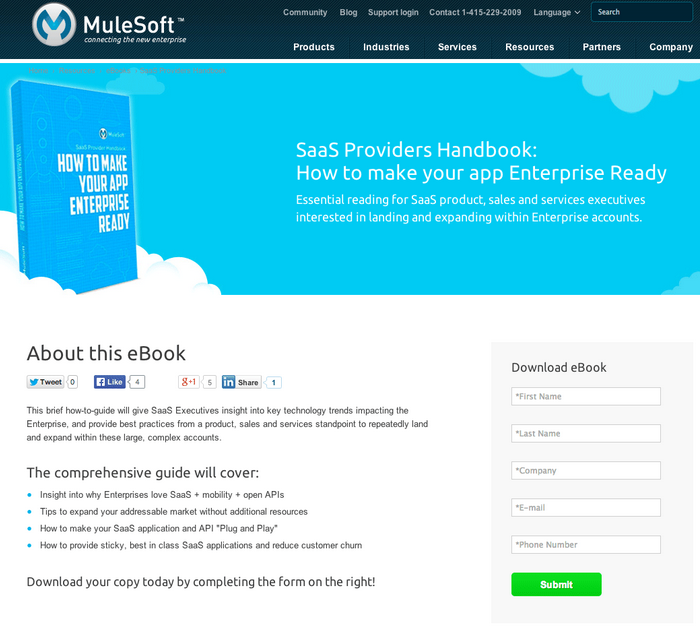 The above example shows a landing page where SaaS executives can learn more about how to position their app from a tech perspective to the enterprise market. How the lead magnet works: This one is self-explanatory. Visitors fill out the form to opt-in and receive the free PDF report via email. Reports usually offer some kind of news and/or best practices. This page is extremely specific as far as who the sales copy is targeting (“SaaS executives”). It’s unclear why someone would want to give up their phone number for this report. This undoubtedly hurts conversions significantly. Even if you’re planning on selling to someone who fills out the form, MuleSoft should give some background on who they are and what value they provide customers. This way customers who fill out the form can have some expectation as to what the sales call they will probably receive will be about. What is it: ListGoal is a free software tool from Bryan Harris and his team over at Videofruit. We use it ourselves here at Autogrow.co. 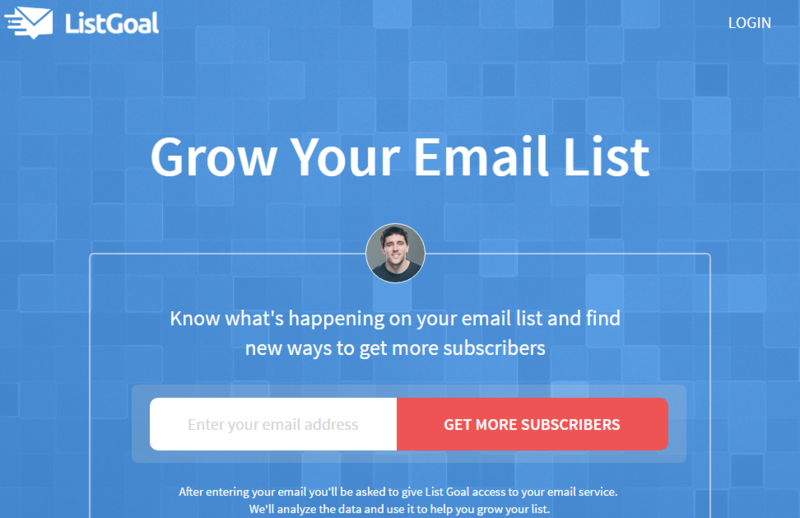 The site allows you to track the number of email subscribers that are joining your email list every day. You can watch the progress of every goal you set at ListGoal and it lets you assess the daily velocity of your goal. How the lead magnet works: To use ListGoal, you first sign up. Then, plug in whichever email tool you’re using and integrate it. ListGoal is installed via your Google Chrome browser. After installation, whenever you open a new tab on Google Chrome, you’ll see your goal, front and center. You can then review your daily subscribers and your overall progress towards your overarching goal. Why it works: ListGoal is incredibly simple to use, making it a great lead magnet. Your list-building goal remains at the forefront on a day-to-day basis. You can also see a direct cause-and-effect relationship play out each day. For example, maybe your new blog article pushed traffic or conversions. With ListGoal, you can see what works and what doesn’t. In that regard, it’s like a pulse on the growth of your email list. What is it: Wild Apricot is an online membership management platform and web-based software. You’ll notice when you visit their site that Wild Apricot offers a 30-day free trial for its software. This is a solid lead magnet. How the lead magnet works: If you follow Wild Apricot’s lead magnet, you’ll be led to their homepage. There, you’ll put in your email address and organization name. Click the yellow button and you can enjoy a 30-day free trial. 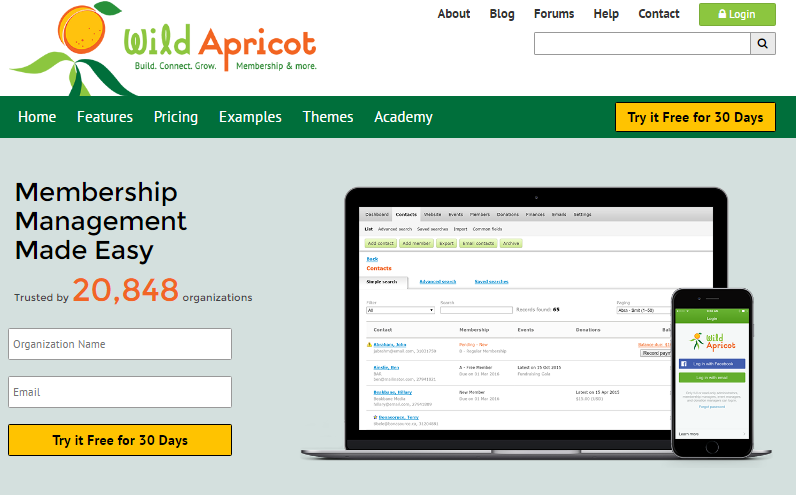 Associations, nonprofits, and clubs use Wild Apricot to manage their members. This also helps to avoid unnecessary complexity like needing Microsoft Excel or a mishmash of third-party plug-ins to manage data. Why it works: It’s really that simple to use Wild Apricot. That simplicity is everywhere, from the homepage design to the above-the-fold offer. There’s a clear call to action in the form of the yellow free trial button. Signing up is simple too, as it only requires two fields. You also don’t need a credit card. Wild Apricot also works as a lead magnet because the homepage has a great visual diagram that communicates the value of the product. This diagram compares the old way of doing things without Wild Apricot to the new way of doing things with the program. What is it: Win in Health is an e-commerce retailer that sells vitamins, supplements, health foods, and sports nutrition. They offer a combination of both information on products and a way to buy those products all on one site. 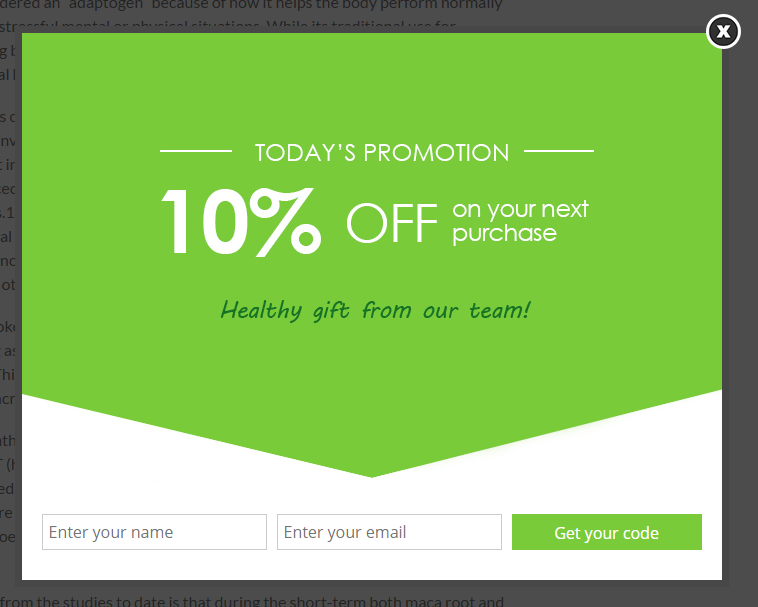 How the lead magnet works: Win in Health’s lead magnet is a coupon that appears as an exit pop-up on their site. It offers 10% off a user’s next purchase. This lead magnet works because it is simple as well and the value proposition is very clear. If you care about saving 10%, you’ll be incentivized to shop at Win in Health. That said, I believe this lead magnet could be better. If there was only an email field required to get the code, that could potentially attract more subscribers. Offering more money off, like 15% or even 20%, would also be good. Why it works: Win in Health’s lead magnet is good in several ways. Since it’s an exit pop-up, it only appears when users are about to leave the page. That recovers potential abandoned carts. The pop-up also shows up across the entire site so it would be very hard to miss it. What is it: All About Tea is a UK-based e-commerce tea site founded by the “Saviour of Tea,” Andrew Gadsden. You can buy wholesale tea, accessories, spices, herbs, fruits, and of course, teas. You can even read tea news. How the lead magnet works: Their lead magnet is an exit pop-up somewhat like Win in Health’s. This one offers a slightly larger discount of 15% with free UK delivery. All About Tea also practices value stacking, which means their offer is more compelling and somewhat more generous in terms of the discount. Why it works: This lead magnet works because, although short (the offer is only three sentences), it’s clear. You know you’re getting an instant discount code on the screen and in your inbox when you sign up. All About Tea’s lead magnet is also responsive and amusing. 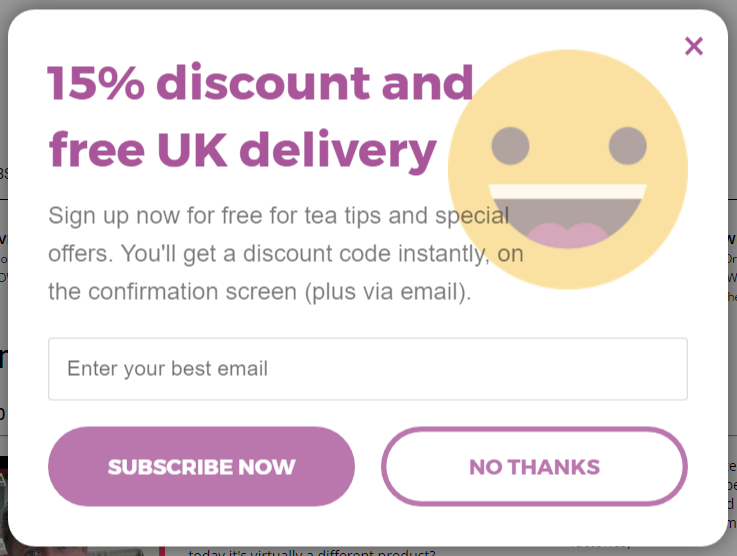 If you hover over the “no thanks” button, the happy face becomes a sad face. What is it: HubSpot is an inbound marketing software company. They have many products and even offer training and industry certifications. Their lead magnet is an open-ended free quiz. 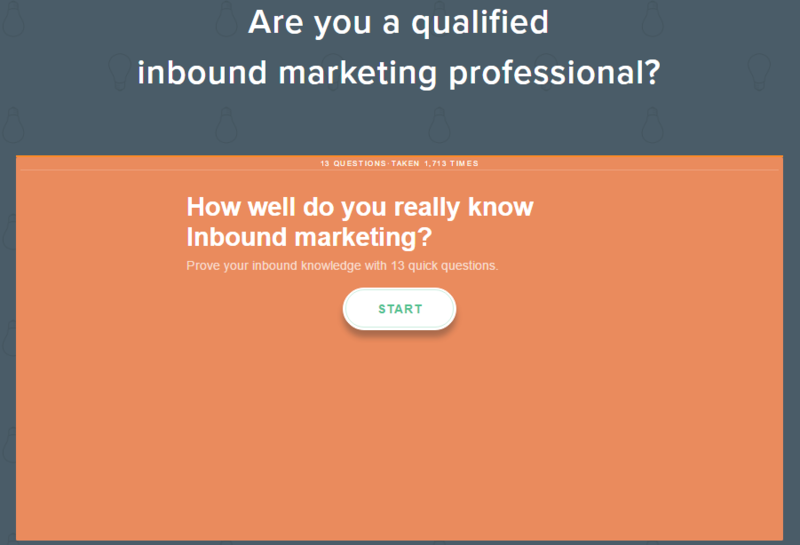 You can see if you’re qualified as an inbound marketing professional. How the lead magnet works: Once you arrive on the HubSpot Academy page, you can read more about the quiz, including how many questions there are and how many people have taken it. You then click “start” and begin answering questions. You can see your progress as you go. 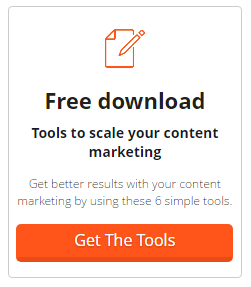 At the end, HubSpot will give you the result of your quiz. There’s no place to put your email address to get your score, as you’re just meant to retake the quiz or share your score. This generates traffic more than leads. Why it works: This quiz is open and simple. Unlike other online quizzes, you don’t need to share personal information to get your score. People want to know if they are at a certain level of status. The word “qualified” in the quiz description and the term “inbound marketing professional” implies a certain status and level of knowledge. Users want to know if they’re at that level. Vanity and competitiveness are at play, especially at the end, where users can share their score on social media. 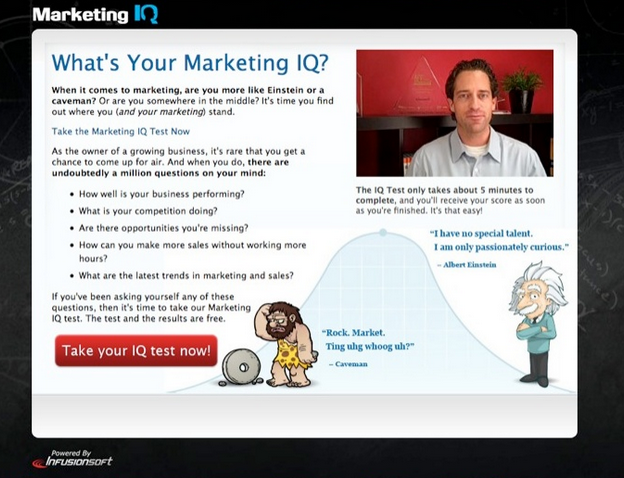 The quiz also works to advertise and draw traffic back to HubSpot. That said, I think it would be better if HubSpot A/B tested adding an email address requirement before users could get their score. Digging these examples? How about 560+ examples of high-converting landing pages, thank you pages, pop-ups, and more to help you take the guesswork out of creating your own? Click here to download yours. What is it: Kopywriting Kourse offers classes so you can write better copy. This site is for entrepreneurs and business owners. That said, the course can also be used to improve your personal writing skills. How the lead magnet works: When you visit the Kopywriting Kourse homepage, you’ll have to scroll to the bottom to read the blog. There’s no navigation elsewhere. The site is focused on getting you to opt in. To do so, you simply enter your email and click the “add me” button. You’re then redirected to a thank-you page with a picture of a couple of dogs hugging on a fence (which is admittedly quite cute). You’re also offered a link to the blog so you can go back to the site. Why it works: Kopywriting Kourse’s lead magnet works because it’s so simple. It’s also intriguing. The design and colors on the website are calming. The photo on the homepage is quite authentic, as it features company founder Neville Medhora. Leadpages research has shown that signup rates were higher on landing pages with a person looking at the opt-in box. The orange/red CTA button also stands out. As a best practice, it’s recommended to use those colors for better conversions. That said, I think there could be a few tweaks made to Kopywriting Kourse’s website as a whole. The site would benefit from more specific copy that defines their audience. A clearer definition of the product would also help. I do like how “sell like hell” rhymes. I think that makes this phrase more believable and memorable. What is it: Smart Marketer is an e-commerce digital training program designed by Ezra Firestone. There are courses in e-commerce store setup, Pinterest ads, Facebook video ads, traffic conversions, and content marketing. How the lead magnet works: As soon as you click onto the Smart Marketer website, you’re greeted by a pop-up. 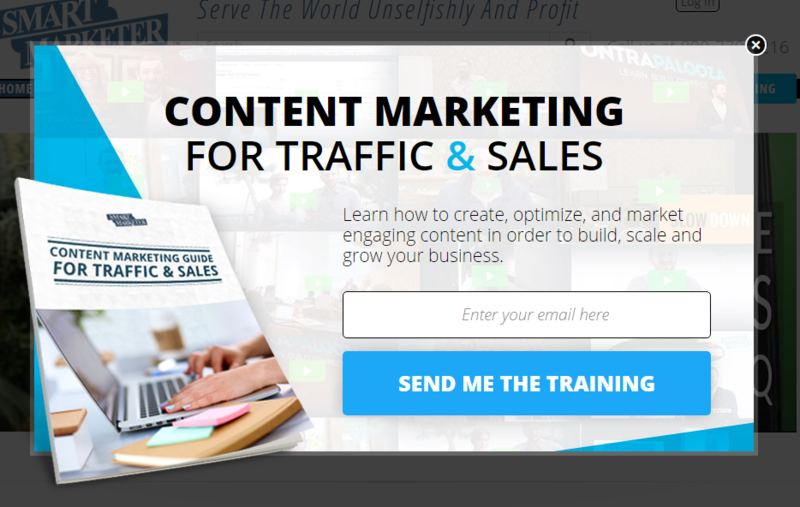 This offers you a sales content marketing eBook that promises more traffic. You only have to enter your email address and you’ll get access to the training. Why it works: You know just what you’re getting with Smart Marketer’s lead magnet. You can see a copy of the eBook in the pop-up. 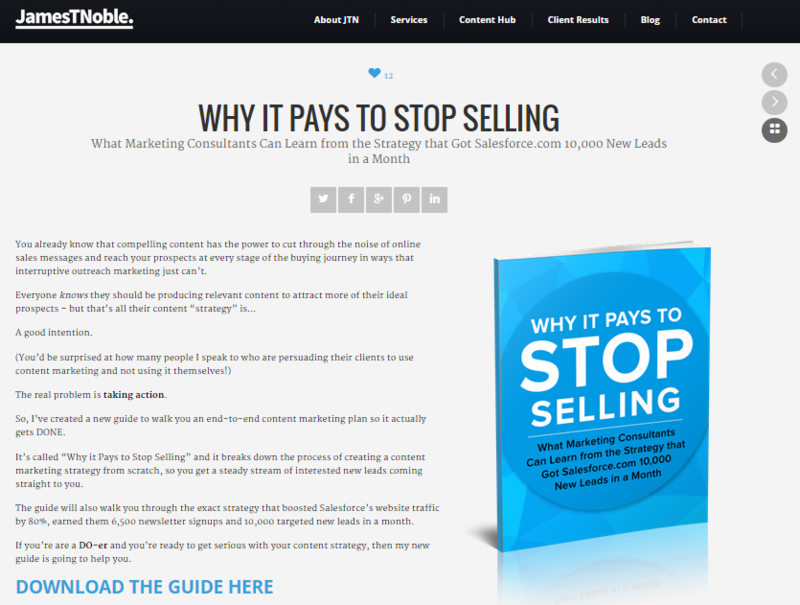 You don’t have to pay for it, yet the book is still packed full of valuable lessons on improving your content. What is it: MarketingSherpa is, as the name suggests, a resource for marketers. The firm does research on marketing trends so marketers like you and I can make use of that information. 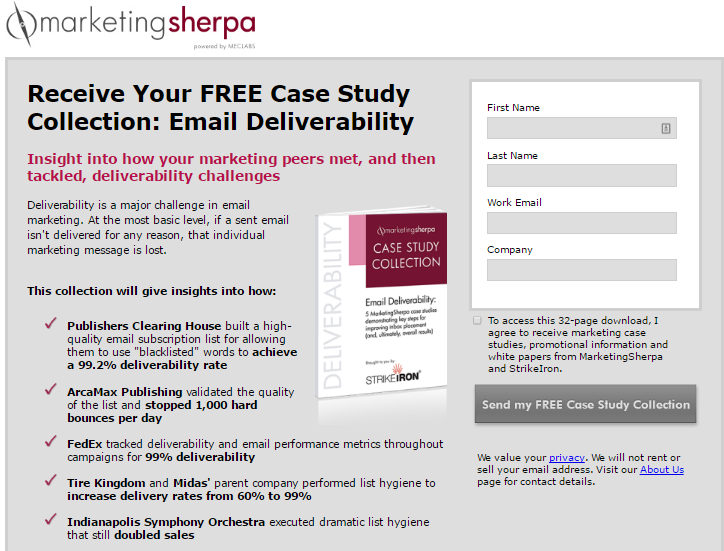 How the lead magnet works: MarketingSherpa offers a free case study on email deliverability. This features brand names like ArcaMax Publishing, FedEx, and Publishers Clearing House. They’re probably going after more established, mid-sized and larger companies with this offer since it mentions marketing peers. To get the case studies, you only need to put in your email address, your first and last name, and the name of your company. You also have to give permission to receive other promotional materials and white papers. If you don’t give permission, you won’t receive any future offers from MarketingSherpa. It does look like MarketingSherpa partnered with a company called StrikeIron for the offer. This could be to drive more traffic or generate leads. Why it works: This lead magnet works because you know what to expect in the case studies. You know the companies that are featured, which makes the offer enticing. You also get to read about the results these major companies achieved. You’ll want to learn what they did so you can do it too. What is it: WP Curve is a done-for-you service to help owners of WordPress websites maintain their sites. Users can keep their plug-ins updated, make graphic design changes, and more on-demand. How the lead magnet works: WP Curve has an opt-in widget on their sidebar that promotes a lead magnet or content upgrade. The lead magnet changes based on the article you’re reading. That makes it a super specific offer tailored to your interests. No matter which post you click and as you read, a tailored lead magnet will appear. You can then click the button and enter your email address to opt in. You’ll receive the offer as a PDF in your inbox. Why it works: The ever-changing toolkit lead magnet on WP Curve’s site has high value. The offers are related to the interests of the user, which makes the user more likely to engage in that offer. What is it: Vacord is a screen-printing company. They work with bands, startups, and local businesses. 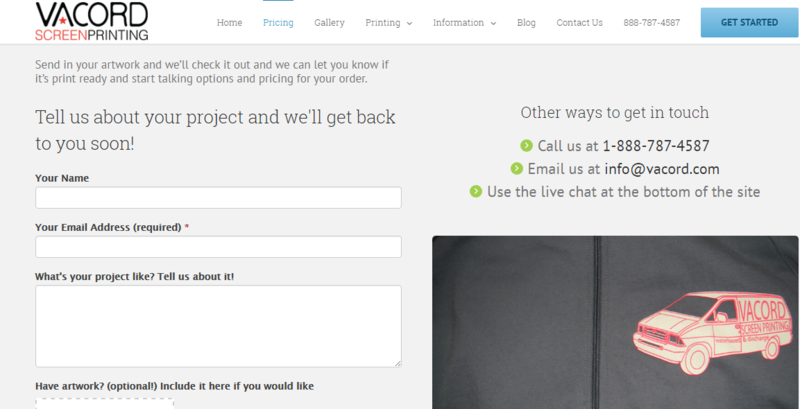 You visit their pricing page, enter your contact information, and then start an email exchange to receive a quote. Use the instant pricing widget on their website. Once you choose which pricing option works best for you and submit your email address, you’ll receive a pricing table breakdown. This tells you how much your order should cost based on the quantity of the shirts and the style of t-shirt you want. Why it works: Vacord lays it all out upfront. You know exactly what they’re charging so you don’t have to guess what your quote will be. Free Lead Magnet Checklist Download: If you’re planning on developing your own lead magnets, make sure to grab a copy of our “11 Point Perfect Lead Magnet (PDF) checklist.” This will help you eliminate the guesswork from the process by giving you a list of proven best practices and key design element. Your offer must be relevant and provide value to the prospective lead in order for a conversion to occur. Your offer should be specific and doesn’t have to be overly complicated in order to produce a great result. What lead magnet ideas will you create using the ideas above? If you’ve already begun testing, which has been the most effective? Let me know in the comments below. What do you think would be a good lead magnet for an amazon associate to use? I get a lot of traffic to my page, but maybe a third clicks over and about 12% of that third ends up buying something. I want to start capturing leads, but I’m not quite sure what to offer as a lead magnet. The only thing I can come up with so far is something along the lines of “Is this product right for you?” type of thing. Any thoughts or insigts you have on this is appreciated. Hi Thomas — I’ll assume the content you’re creating is what attracts the traffic and links over to Amazon. Let’s say it’s talking about wildness survival gear. In this case, you could create a content upgrade or, even better, an exit detection pop-up with something like “Could you survive in the woods? Download our FREE 7 point gear survival checklist to find out what the pros recommend.” Something like that. Thanks, hope to hear more from you. I expected this post would have 300 comments! After reading the whole post, I am wondering which lead magnet I should use… Each of them is just awesome way to collect quality leads. Thanks for reading and commenting Cathy 🙂 hope to hear more from you. The right lead magnet really depends on your end goal and the context. Stumped for Ideas for a lead magnet for a organic juice company 🙁 Any ideas? Research something health-related and put together a checklist. Checkout what questions people are asking on Quora or Reddit. Cool lead magnets ideas. would like to know what you think about placement (left vs. right) and also does pop-up is better than slide up ? Hi Nate, I don’t have hard data to answer this question. I recommend testing it for yourself. A regular exit-detection pop-up works well for us. The important idea is to make meaningful structural change if you want meaningful results. i want to offer 9 tips for pregnant woman to connect to their baby during pregnancy. Im struggling with how to make that sound compelling! It still doesn’t feel right..
Any advise or ideas would be greatly appreciated! For instance, if your family therapy practice addresses the issue of young kids who don’t listen to / obey their parents, you might want to take a “fear” / curiosity based approach. Decent article. I love the lots of examples! Thanks for writing this awesome article. I’ve been reading for a while however I’ve never posted a comment. I’ve bookmarked your website and shared this on Facebook. Thanks! Much appreciated. Hope to hear more from you. I like your superpowers reference as not only being able to lift a building with inhuman strength but as being able to do something better than others in the real world. I am going to look into your example of free ebooks because, with the kind of blog I run, I think it will be best. Thanks for the article- lots of great examples! I have a small Vegetable box program business (we grow and sell vegetables via a subscription like box delivery program)-www.greenhartfarms.ca. I’m trying to create a good lead magnet, but I’m kind of stumped. What would you suggest? Hm, great question for a unique (and healthy!) business. What you’re selling in the end, is better health and better quality life. So sell that benefit directly with your lead magnet and it will align well with your core offering. stumped for ideas for a mosquito net company..any ideas? Hm. Think about the problem solved and how what you can create will educate the market. Perhaps something that warns of the “dangers” of mosquitos, or compares options to solve the problem.